"I'm going to do the thing that God put Ron Burgundy on this Earth to do: Have salon quality hair and read the news." After much anticipation and a relentless marketing campaign, it's finally here. Anchorman 2: The Legend Continues, the brainchild of star/co-writer Will Ferrell and co-writer/director Adam McKay, picks up where the original cult film left off, nearly a decade later. It continues the strange, absurdist humour into the next decade, but with a different, more satirical vibe, stretching moments of surrealistic hilarity with awkward political satire. The film flirts with being a disjointed, unfocused mishmash of competing comedic elements despite Ferrell's Rob Burgundy cementing his status of an "enduring comic character" and many scattered laughs through out. Most, if not all, scenes are funny, sharp, and endearing yet they don't quite fit together the way the first film (barely) did. 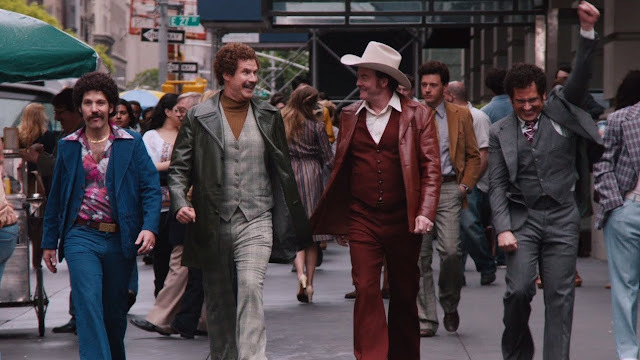 Anchorman 2 takes a while to get into it as it starts with an extended sequence of Burgundy recruiting his old team. McKay changes the landscape to 1980 in New York and the birth of the 24-hour cable news channel under the guise of a corporate dominated media landscape. Everyone's back as Paul Rudd, David Koechner, Steve Carell, and Christina Applegate return as the quirky bunch of newscasters. However, they're mostly cast aside for meandering side stories with James Marsden (as a great villain), Harrison Ford, Meagan Good, Dylan Baker, and Greg Kinnear. Carell's limited character starts to grain on you as he's given an oddly unfunny and superfluous love story with the barely seen Kristen Wiig. What's so surprising is how straightforward and conventional the story and plot is, or rather, that there is a logical story and plot to follow. Save for the film's big final sequence, we follow Burgundy and team as they change the industry and bring on the unsubtle sensationalization of the news. Whereas, the original Anchorman balanced hysterical comedy and bizarrely fantastical asides with grace and charm, Anchorman 2 struggles to juggle them as it skewers the state of modern media. At a luxurious two hours, the film drags in the middle only for an extended set piece at the end, reminiscent of the first, to almost redeem everything else that came before it. This scene is so audaciously over the top as to satisfy our thirst for crazy antics and nonsensical humour. There's so much going on while McKay tries to preach the ills of our current state of journalism with their trademark offbeat antics. All this mirrors Ron's arc strangely. I'm not sure how many times Burgundy screws up only to redeem himself with insane gestures. Even though McKay and Ferrell recycle their fair share of gags, the ones that offer new, interesting twists succeed as they take risks, trying to go for so much more (with mixed results) in the sequel. Anchorman 2 is fairly well-made and executed yet the big laughs and random elements don't quite work together with the heavy-handed storytelling. Taking the Channel 4 News team out of sunny San Diego and into the more serious 1980's New York cable news world unbalances the absurdist humorous feel. McKay and Ferrell strike many chords but the bizarre charm, comedic momentum, and sheer fun of the original Anchorman: The Legend of Ron Burgundy isn't replicated quite as well. It's just as outrageously hilarious as it is underwhelming and forgettable.